Oyster Brokerage ask me to mention that they'll be displaying the recently delivered 30.8m sailing yacht Penelope at the upcoming Palma Superyacht Brokerage and Charter Show. An Oyster 100 by Dubois, Penelope is designed with the specification, features and classification of much larger yachts. The standard accommodation layout offers three staterooms aft and two crew cabins forward. A raised saloon offers a panoramic view and leads forward and down to a more intimate lounge and separate dining area. Forward of the main living area is the crew mess, galley and two crew cabins. 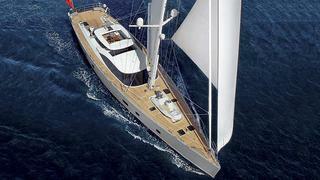 A finalist in the 2013 World Superyacht Awards, Penelope is asking €10 million.